"You have an agreement you can't even say properly and it doesn't say what it's about," says Alan Beattie. "It's wrong on every level." 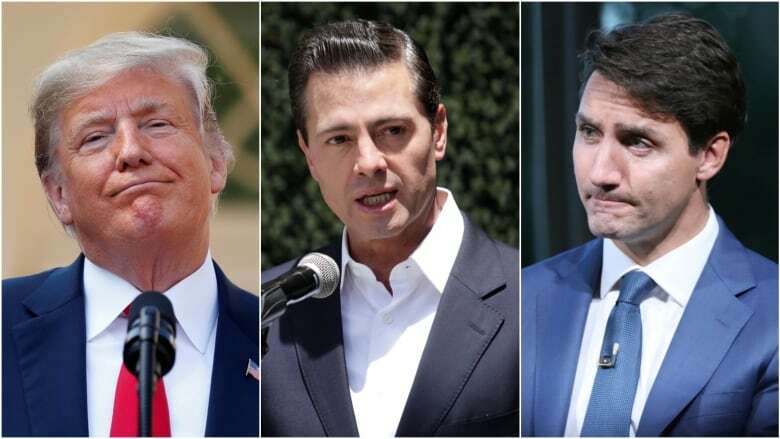 Not only does the new United States-Mexico-Canada Agreement (USMCA) not include the words "free trade" anywhere in the title, but it's "an agreement you can't even say properly," says Financial Times writer Alan Beattie. Beattie, who writes about trade, says the new abbreviation is an abomination — and he has strong words for anyone who dares call it an acronym. He spoke to As It Happens host Carol Off about why a good acronym is worth fighting for. Here is some of what he had to say. USMCA doesn't really roll off the tongue, does it? It doesn't and for those of us who care about language as well as trade deals, it's kind of disappointing. NAFTA was such a lovely thing. You could say it as a single word. You know, you could adapt it into slogans like "NAFTA, we don't hafta." Now it's been replaced by yet another abbreviation that you can't say very well. But you've taken this one step further. You're not just kind of disappointed. You're mad. Because why? Because of how people are using it? I'm also mad because people say acronym when they mean abbreviation. An acronym is a thing you can say. NAFTA is an acronym. And I don't think we should give abbreviations the name of acronyms because they haven't deserved them. You say this is a hill that you're willing to die on. [Chuckles] I'll tell you why. I've covered trade for more than 10 years, OK? When I started as a journalist, when I started covering trade, I realized this is a subject so complicated that the abbreviations started running into four letters. Before that, basically all the stuff I'd covered ran into three letters. So keeping in your head all these enormous abbreviations, when you came across one you could actually say, that was actually a proper acronym, you really wanted to sort of hold onto it. So the fact that this is gone and disappeared and nobody but me seems to be as angry about it, that I just find very disappointing. Of course, people are arguing that, in fact, you can turn it into an acronym. You could say oos-MACK-ah or OOHS-mickaw or something of that nature, right? I mean, all is not lost here, Alan. The reality is a vowel shortage. There aren't enough vowels. There's two, but they're inconveniently placed on either end. You see, what you really need is some kind of vowel in the middle. One other thing I've noticed, which is unbelievably deceitful, is people just switch the consonants around. And so people will kind of go, "Oh, we can say oh-SECK-mah." And I'm like, you could say oh-SECK-mah, yeah, but that's just demonstrably wrong because the consonants are in the wrong order. You could also switch it around. Someone's suggested that we could call it the Canada-Mexico-U.S agreement and say CAMUS. That, I think, would be perfect. That would be absolutely perfect. Camus is the great novelist, the chronicler of existential despair, and there's nothing that's closer to existential despair than the world trading system under Donald Trump. But what's missing, obviously, besides the extra vowel is the words "free trade." The idea of trade and free trade and so on has now become so discredited that you have an agreement that's about trade and you don't even say what it's about. You have an agreement you can't even say properly and it doesn't say what it's about. It's wrong on every level. Written by Sheena Goodyear. Produced by Chris Harbord. Q&A has been edited for length and clarity.